UTQIAGVIK -- Flora Atqaqsaaq Patkotak and Maggie Sikvayugak sit in the kitchen, piles of niulingat, or caribou tendon, laid out on the wooden table in front of them. Their fingers deftly work the thin, white strands, splitting them in half over and over again. By the end of the process, they’re left with long pieces almost as fine as dental floss. She's been splitting tendons for about an hour a day for the past week. After seven hours of careful work and concentration, she's got about three-quarters of a bundle. Once she has a full bundle, it will be braided and set aside in a freezer until it's sewing time. "Splitting is tedious," she says. "It's one of the longer processes, I think, in getting ready for sewing." The sewing she’s referring to is the process of hand-making the ugruk, or seal skin, boats, Utqiaġvik whalers will use in the spring hunt. It’s done by amiqtit, or the women who sew the boats. Patkotak and her husband, Josiah, are part of his family's crew, of the same name. Sikvayugak, 23, is engaged to whaler Tavvin Leavitt, who has family ties to both the Anaġi and Pamillaq Crews. "I started dating my fiance now when we were 16 going on 17," says Sikvayugak. "So, his family has a history of whaling. I come from Anaktuvuk Pass, which is in the Brooks Range, and I'm not really familiar with the whaling lifestyle because we're surrounded by mountains and not the ocean. I grew up working with animals that have legs, as opposed to coming to Utqiaġvik and these animals have flippers." She smiles, recalling a moment when one of his aunties had a talk with her. "(She) told me if I'm going to be marrying a whaler and somebody who provides with whaling, it would be important that I start learning these things that are crucial to the culture here." Work like this is often done by the women in whaling families. While there is sometimes a division of labor, there are women harpooners and whaling captains and men who sew, and the tasks are not always strictly divided. 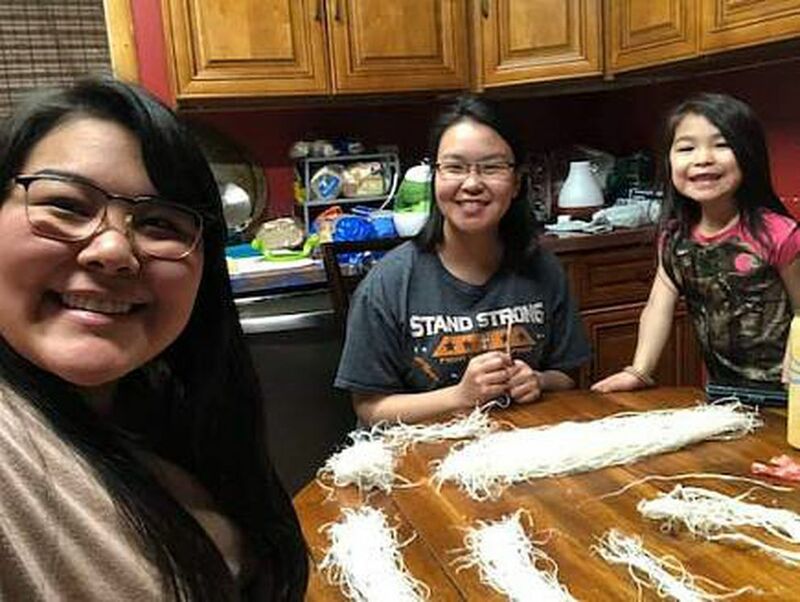 Both Patkotak and Sikvayugak learned how to split from older women mentors, including Doreen Ahgeak, Roberta Leavitt, Josie Kaleak, Cora Brower and Nancy Leavitt. Each of those women took the time to share their knowledge, sometimes over the course of many years. "If I could list them all, it would be a long list," says Sikvayugak. In the last few years, Sikvayugak has made a concerted effort to practice this work, after having left it for a while following the death of two of her mentors. "I felt like a part of me went, too," she says. But through her friendship with Patkotak and her connection to both whaling families, she's come back into the fold. "What it means to me working with her on this is being able to connect on a level with our end goal to make sure these whalers are safe," Sikvayugak says. "To me, it spiritually and emotionally touches me that she considers me (to) help." And help is something Patkotak says she welcomes. Working with the tendons is a long and arduous process that begins the year before, during tuttu, or caribou, harvesting season. "I posted on our whaling crew's group page and requested that we collect tendons this summer," said Patkotak. "The ideal thing to do is get them off the legs as soon as you catch them. If you leave it out for a day or two, it will dry up and just rip. You harvest the tendons as soon as you catch the tuttu." Once you remove the tendons, you scrape the meat off with a spoon, she says, and then put them in a plastic baggy and stick them in the freezer until the end of October or beginning of November. "Once those freezing temperatures come, you thaw them out and soak them in water overnight until it gets the slimy. We call it mami — the gooey, slimy stuff that's around the meat muscles if you're taking care of any fresh meat — you want to scrape all of that off with a spoon after it's soaked in the water overnight," she says. After you scrape the tendons and get them clean and white, you get a needle and thread them together by their tops. Once the temperatures are at least 10 below, you hang them outside to dry. "What's happening is the water that got soaked into the tendon before, when you were scraping it off with the spoon, all that water that absorbed into the tendon is freezing on the outside of it," says Patkotak. "So, you brush all the snow and ice off and it will keep drying that water out of the tendon and freezing on the outside." You brush the niulingat once or twice a day for a couple of weeks, gradually cutting back until you take them down. This year, Patkotak says she started in early November and they were out until Christmas. It's a very specific process, full of steps that need to be followed fairly closely to get the right end result. For Patkotak, it's taken trial and error to get it right. Last year, she says she started a bit too late and they weren't drying fast enough outside. "I kept bringing them inside and having them try to dry that way, but it made them a lot more crispy — a lot harder and harder on my fingers," she says. She turned to others for help and credits Nancy Leavitt with doing the braids for last year's boat. This year, though, she's backed up her timeline and is on track to finish in time to work on the skins and then the boat. Her goal now is to braid for the entire boat herself. "Inupiat were their own scientists and they knew these things," she says. Those who came before her knew what needed to happen season by season for the yearlong process of preparing for and having a successful whaling harvest. That knowledge, start to finish, from gathering to preserving to storing and hanging, to watching for the right temperatures, and memorizing the techniques — all of it has been passed down. Holding that skill set now is a big responsibility, Patkotak says. "I'm honored to be able to learn this knowledge and to keep passing it down to my kids or to anybody that's willing to learn," she says. "It's vital information. These tendons weren't only used for sewing on skin boats. That's what they sewed fur parkas with. Nowadays, you can get thread from the store, but this is what they used. (It's) putting more perspective into the steps that they had or the preparation that they needed to do to have clothes, even." Sikvayugak says she, too, is proud to have had the chance to learn alongside the women in her and her fiance's family. "I think it would be nice to bring up women in their identity and their culture. It's something that's a lot to take in at first, but I feel like if we, as women, want to continue on with our traditions and culture, (we need) to bond together and learn this," she says. "So, once it comes to our time to teach the next generation, we'll be able to. I feel like that's an empowerment to women. I don't know if it's just women or if there are men sewers out there too — but I feel like it would be an empowerment to our Inupiaq identity." By the end of the session, their fingertips are sore. Patkotak says hers just stopped hurting the night before from the weekend splitting. She's good-natured about it though, chuckling as she says maybe she'll be able to find a nail hardener to paint on to make it a little easier. She and the other women around town who are also doing the same work will keep splitting for the rest of the month. "It's tedious," she says. "But it's for the love of maktak, for the love of whaling, for the love of serving your community and for the love of our culture and families, for the love of our amiqtit family." In February, when the sun starts coming up above the horizon, it will be time to bleach the skins. Then the amiqtit will get to work making the boats that will carry the whalers past the ice and out to sea to gather the harvest for their community. This article was first published in The Arctic Sounder and is republished here with permission.